Ukraine and Turkey intend to continue coordinating their actions in the protection of human rights in the Crimea occupied by the Russian Federation. President of Ukraine Petro Poroshenko made a relevant statement during a briefing on the results of bilateral talks, according to the correspondent of QHA. “Despite all peace initiatives, the aggression of the Russian Federation against Ukraine continues, as well as the annexation of the Crimea. Together with President Erdogan, we noted the inadmissibility of the human rights situation in the Crimea, which is constantly deteriorating due to the repressive actions of the occupation authorities. Searches and arrests, persecution and pressure, intimidation and ousting of all those who do not agree with the policy of the occupiers, unfortunately, have become routine in the Crimea. The Crimean Tatars and representatives of the Mejlis of the Crimean Tatar people became objects of special oppression. Ahtem Chiyhoz, Ilmi Umerov, Mykola Semena, and the list continues. And today we have agreed to continue coordinating our actions in protecting the rights and freedoms of Ukrainian citizens in the Crimea, including monitoring," he said. Poroshenko went on saying that Russia is obliged to comply with the UN General Assembly resolution 71/205 and the interim measures adopted by the decision of the International Court of Justice. He also expressed the hope that Turkey would become a member of the club of friends of Ukraine in the matter of Crimea's de-occupation. In turn, Recep Erdogan noted that Turkey continues to monitor the situation with human rights in the occupied Crimea. “I once again assured Petro Poroshenko that Turkey continues to support the sovereignty of Ukraine and its territorial integrity, including the Crimea. We did not recognize and do not recognize Russian annexation. We are satisfied with the support that Ukraine provides the Crimean Tatars, who proved loyalty to their country. We will continue to monitor the status of our brothers' rights and will continue to raise this issue at the international level," the Turkish President said. 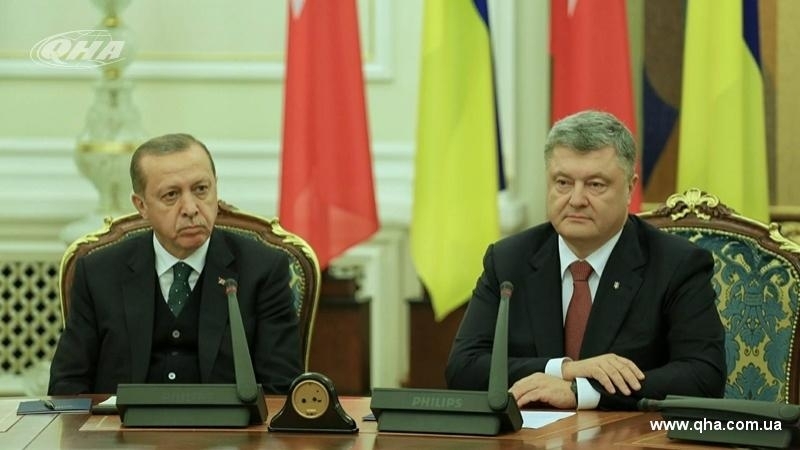 According to the Turkish leader, the problem of the occupation of the Crimea and the conflict in the east of Ukraine can be solved only on the basis of international law. Earlier, QHA reported that October 9, Turkish President Recep Tayyip Erdogan arrived in Ukraine on an official visit. The previous meeting between Erdogan and Poroshenko took place on September 21 in the fields of the General Assembly of the United Nations in New York, where the presidents discussed preparations for the sixth meeting of the High-Level Strategic Council between Ukraine and Turkey in Kyiv. Earlier, Poroshenko visited Turkey in March 2016, and Erdogan visited Ukraine in March 2015. In March 2017, Ankara hosted an official welcoming ceremony for Prime Minister Volodymyr Groysman, who arrived in Turkey on a two-day visit. During his visit to Ankara, Groysman discussed with the Turkish authorities the possibilities for multilateral cooperation between the two countries, particularly in the sphere of economy and trade. Moreover, an exchange of views took place on issues relating to the situation in the East of Ukraine and the situation of the Crimean Tatars.